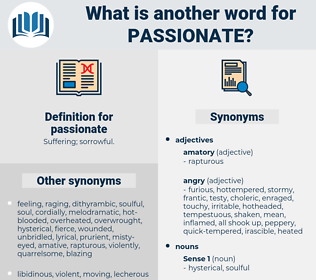 warm, sentimental, earnest, wholehearted, devout, excited, exhilarating, cordial, anxious, dramatic, vibrant, committed, dedicated, interesting, compelling. 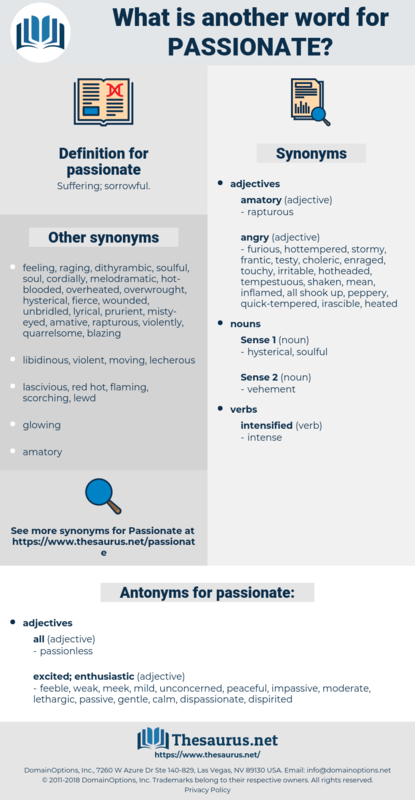 heated, avid, intense, exciting, vehement, lively, keen, fiery, fierce, fascinating, staunch, spirited, strong, eager, vigorous, heartfelt, intensive, violent. feeble, weak, meek, mild, unconcerned, peaceful, impassive, moderate, lethargic, passive, gentle, calm, dispassionate, dispirited. cool, unexcited, uncaring, cold, indifferent, frigid, happy, dull, Unpassionate, unenthusiastic, apathetic. immaculate, impersonal, maidenly, virginal, monkish, innocent, lily-white, undersexed, dry, detached, puritanical, monastic, moral, straitlaced, prudish, objective, pure, modest, celibate, chaste, virtuous, prim, reserved, decent, priggish. Not, perhaps, because of any great and passionate need of her, but because he would have thought her unhappy in what she had done, and would have sought to save her. He had a passionate love for the land - for England - which had given him birth; and he had a decent pride in her honour and good name.